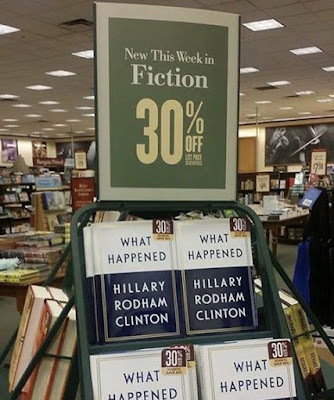 Hillary's new book, WHAT HAPPENED, is not doing well and may be headed to the dollar bin soon. Not surprising, since not many of her supporters can’t read anyway. The Dollar Store released a statement about Hillary's new book, WHAT HAPPENED: "Don't send that book here, we sell stuff that's WORTH a dollar." I don't know why they name storms after Grandmas, like Irma. That's not scary. They should name them after horrible monsters. Hurricane Godzilla might scare me. How about Hurricane Satan's Spawn. Hurricane Dracula. Hurricane Hillary -- yikes! Hillary Clinton gave an interview demonstrating alternate nostril breathing, which we sane people call BLOWING ONE'S NOSE. This is a bit different than all the people who just held their noses while they voted for her. Hillary's new book hasn't hit the $1 bin in the book stores yet, but it's well on its way. No worries. Hillary's bar tabs are way more bigly than the bar sanctions her lawyers face. Hillary Ramrod'm has a book out about her election loss titled "What Happened." What happened? YOU happened, Hillary. She blames it all on Bernie Sanders, the DNC and FOX News. Nevermind those other three, eh Hillary; like Benghazi, emails and people who work for a living. Hillary Clinton is promoting a new left-wing website named Verrit, just "for the 65.8 million" people who voted to elect her president. So how will Hillary keep out all the "undocumented workers" who couldn't vote her?